“Going green” is more than recycling or using less paper. As consumers get more conscious about leaving their carbon footprints and living a more eco-friendly life, marketers are developing creative engagements that are immersing consumers in modern environmental causes and in CSR missions. These strategies are getting the attention of cause-supportive millennials and transforming the entire experiential design space in the process. Dunkin’ Donuts is capturing headlines with it’s The Home That Runs on Dunkin’ tiny house program, created with Airbnb and Olivia Wilde. The structure runs on 80 percent biofuel from 65,000 pounds of used Dunkin’ coffee grounds, produced in partnership with Blue Marble Biomaterials. It combines 80 percent coffee oil from spent Dunkin’ coffee grounds, with 20 percent alcohol, allowing for the fuel to burn more quickly and sustainably. While the Home That Runs on Dunkin’ is staying in The Big Apple for the weekend, they’re working towards having it debut in other cities nationwide. They’re currently looking at allowing consumers to actually stay in the home. The Economist hit the streets of five cities with a branded coffee cart and a mission to highlight the impact of food waste on the environment. The “Grounds for Change” program was based on the publication’s report, “Oil in Your Coffee,” that like that Dunkin’ tiny house, highlights the little-known uses for coffee grounds, like creating biodiesel fuel. “The campaign brings The Economist’s mind-stretching journalism to life and challenges potential readers to consider new ideas and solutions to reflect on more environmentally sustainable approaches towards food production and consumption,” said Marina Haydn, senior vice president of circulation and retail marketing at The Economist, in a statement. Daimler’s Mitsubishi Fuso brand, maker of the first mass-produced, zero-emission truck, put its money where its wheels are by opting out of a traditional product launch in a convention center, and instead, repurposing an outdoor parking garage and transforming it into the Positive Energy Station. The space featured a concrete floor covered with grass, and ivy curled around the gas pumps—a visual nod to how the all-electric eCanter will help reduce the need for gas stations in the future. After the official unveiling of the truck at a global media launch event, afternoon workshops rounded out the experience. On the second day, fleet directors and managers, logistics companies and brands that specialize in deliveries attended a series of similar presentations, including a talk by directors of New York City’s sustainability and fleet management departments. Attendees both days also got to take the eCanter for a brief ride-and-drive on the streets of New York. Citi for its Global Citizen Festival hospitality lounge last year leveraged recycled wood, lush greenery and biodegradable elements for the design. For six years, Citi’s cardmember lounge has been the focus of its festival sponsorship, but in an effort to boost its support of Global Citizen and underscore its own philanthropic efforts, the brand for the first time activated pre-festival events that benefited the organization and its mission. Experiences ranged from an exclusive Mumford & Sons show for Citi cardmembers in which ticket proceeds benefited Global Citizen and Children in Conflict, to panel talks, to a co-branded branded takeover of bicycles in the Citi Bike program. The brand also led its first “Action Journey,” a Global Citizen app-based activity in which participants earned points by submitting a photo of how they are helping their community, and tagging it with #pathways2progress (the hashtag used to promote Citi’s own charitable work), for a chance to score tickets to Global Citizen Festival. Rounding out the week’s events was the festival itself, which attracted more than 60,000 attendees and featured performances by a variety of acts including The Lumineers, The Chainsmokers and Alessia Cara. 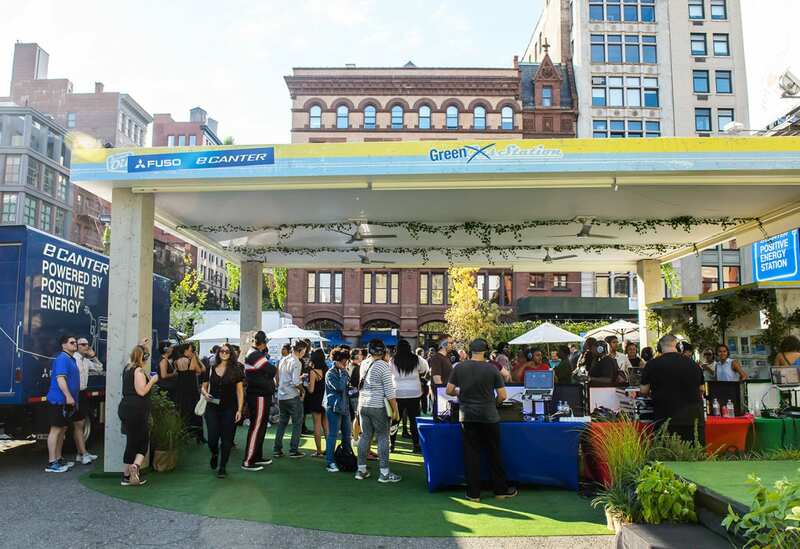 At its exclusive hospitality lounge, Citi offered cardmembers a place to cool off, watch performers on myriad screens and indulge in catered fare inside an eco-chic space featuring recycled wood, lush greenery and biodegradable elements. Attendees could also engage with the on-site mixologist, who offered craft concoctions, including a cocktail served inside a pepper, or participate in a shareable Polaroid photo engagement. A handful of influencers, including Chelsea Yamase (@chelseakauai), also made appearances at the lounge. Brands recognize that beyond an experience, they need to inspire consumers to take action to help make positive changes for the environment.